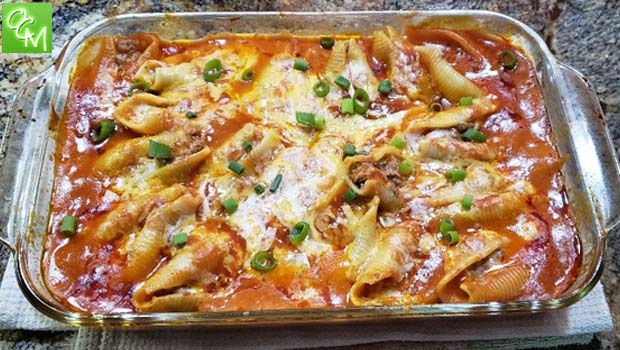 Mexican Stuffed Shells Recipe – Stuffed shells Mexican style is a great take on the Italian stuffed shells dish. See recipe here for my Italian stuffed shells. Stuffed shells are pretty versatile, so I decided to come up with a Mexican version. These came out great and any cheesy sauce left at the bottom of the dish or any left over meat mixture goes great with some tortilla chips. Preheat oven to 400 degrees. Cook pasta for about 9 minutes (pre-baking cook time). While pasta is cooking, saute onions in oil until translucent. Add in ground beef and cook. Add in chile con queso. Rinse cooked noodles in cold water and drain. Coat bottom of large baking dish with a layer of enchilada sauce. Fill each shell with a generous amount of the cheesy beef mixture and place in the baking dish. Top with half of the grated cheese, then the remaining sauce until well-covered (there may be some left over), and then the remaining cheese. Cover with foil and cook for 30 minutes. Top with sour cream if desired.